A single Dynamic Investment can be the ONLY investment you hold. It is fully company-diversified by the use of ETFs and it is asset-diversified by holding ETFs for multiple assets in its Dynamic ETF Pool (DEP). And it is also “time-diversified” by being capable of changing the ETF it holds based on a periodic observation of market trends. You saw on this page the superior performance of just holding a simple DI with a Stock and Bond ETF in its DEP for the period from 2007 to 2018. Who would not have wanted to hold this investment during this turbulent period when the value of static, MPT portfolios was experiencing significant fluctuations in value. But the NAOI knows that allocating 100% a portfolio’s money to one ETF at a time can be too much of a "culture shock” for most investors. Most NAOI students prefer to include DIs in a more traditional portfolio structure. And this is easily done by treating DIs a building blocks for Dynamic Portfolios. This type of DI contains ETFs in its Dynamic ETF Pool (DEP) for different asset classes. Thus, it rotates between or among owning the major assets based on which is trending up most strongly as the time of a Review. The asset classes used will be mainly Stocks and Bonds but could also include Real Estate, Commodities, Emerging Markets, etc. Below is an example of the ETFs that a Multi-Asset DEP might hold. This is followed by a table that shows the 2008-2017, inclusive, performance of an MPT portfolio and a Dynamic Investment working with the same ETFs. 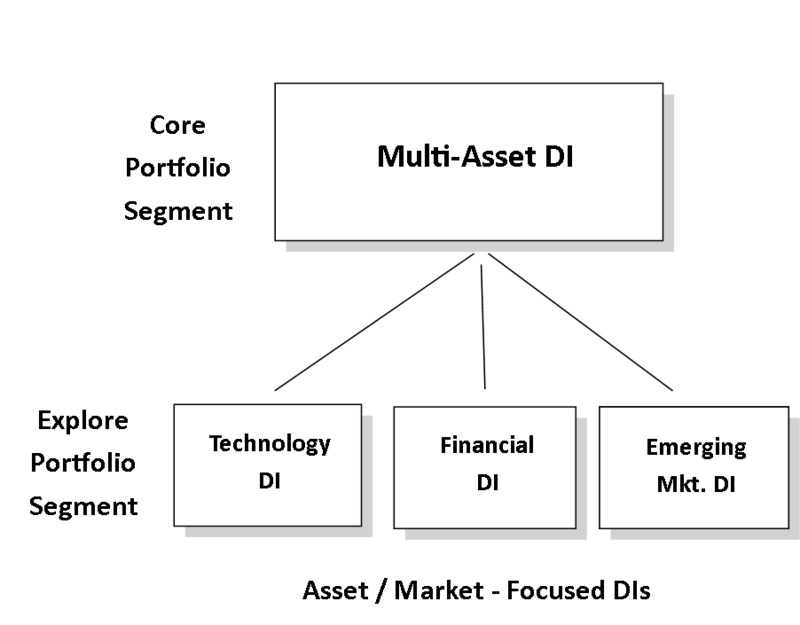 The following diagram shows at left a sample DEP for this DI type and then, at right, a performance comparison between a traditional MPT portfolio with the allocations shown and an example Multi-Asset Class DI. Holding 60% RZG and 40% EDV, rebalanced quarterly for the period would have earned an average annual return of 12.1% with a Sharpe Ratio of 0.82. Simply buying and holding PNQI for the period would have produced an 18.7% Average Annual Growth Rate with a Sharpe Ratio of 0.75. This portfolio can hold up to four ETFs at one time and thus be more acceptable to investors who are accustomed to holding multi-equity, MPT portfolios. But keep in mind the differences. Each of these dynamic building blocks will strive to hold only ETFs that are uptrending at the time of purchase and they avoid ETFs that are trending down. Plus, each ETF held is protected against significant losses while owned by a Trailing Stop Loss Order. This enables far higher performance than MPT portfolios that are designed to hold both winning and losing equities at all times. In this configuration the DI would act as both a returns enhancer and a risk reducer for the portfolio. The higher the allocation to the DI segment, the better will be the performance of this Hybrid Portfolio that can easily be implemented today with NAOI training. On the following page I will show how an NAOI Hybrid Portfolio makes the perfect 401(k) default investment.